Toward the middle of the 1950s, abstract art became a dominant trend in the Latin American cultural scene. Many artists incorporated elements of abstraction into their rigorous artistic vocabularies, while at the same time, the representation of geometric lines and structures filtered into everyday life, appearing in textiles, posters, murals, and landscapes. 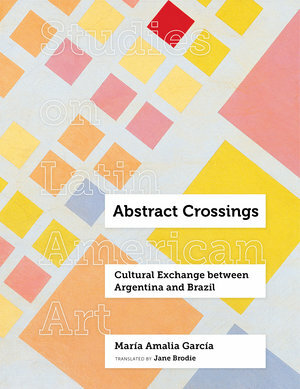 The translation of a field-changing Spanish-language book, Abstract Crossings analyzes the relationship between, on the one hand, the emergence of abstract proposals in avant-garde groups and, on the other, the institutionalization and newfound hegemony of abstract poetics as part of Latin America’s imaginary of modernization. A profusion of mid-century artistic institutional exchanges between Argentina and Brazil makes a study of the trajectories of abstraction in these two countries particularly valuable. Examining the work of artists such as Max Bill, Lygia Clark, Waldemar Cordeiro, and Tomás Maldonado, author María Amalia García rewrites the artistic history of the period and proposes a novel reading of the cultural dialogue between Argentina and Brazil. This is the first book in the new Studies on Latin American Art series, supported by a gift from the Institute for Studies on Latin American Art. Dr. María Amalia García is a member of Argentina´s Scientific and Technical Research Council (CONICET) and teaches at Buenos Aires University (UBA), Argentina. She has contributed to publications such as ARTMargins, Revista do Instituto de Estudos Brasileiros, Anales del Instituto de Investigaciones Estéticas, and Goya. María Amalia García also has performed as curator and art editor at Museo de Arte Moderno de Buenos Aires since 2016 and as curatorial consultant for Cisneros Modern Collection at The Museum of Modern Art of in New York (2019).